On the night of June 6th 1944, Operation Overlord, "D-Day", signaled the opening of the Second Front in France. Thousands of allied landing craft began disgorging troops on five French beaches, under cover of air- and naval bombardment. 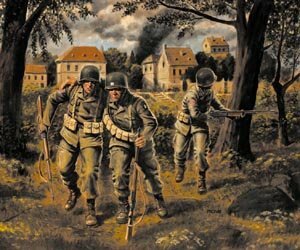 The 101st and 82nd American airborne divisions and 6th English airborne division were dropped by parachute and gliders 10 - 15 km inland, deep behind the German lines. Even though the paratroopers were widely spread while landing, they nevertheless managed to occupy crossroads and to keep the German troops engaged. This provided invaluable assistance to the troops landing on the beaches. 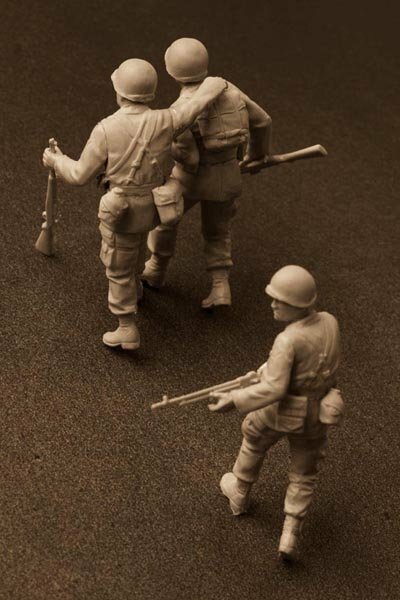 This kit includes the figures of three U.S. paratroopers, who are moving carefully through the German rear areas, trying to find their comrades.